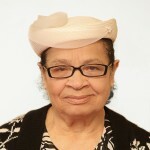 Edna was born on the Caribbean island of Jamaica in Trelawney and came to live in the UK in 1961. She arrived with her 5 children and husband, the late Pastor Tony Wood, who passed away in 1978, after 23 years of marriage. They all started attending PCF in 1961, shortly after arriving and has been a member ever since and has served as a Deaconess and officer for many years. Edna has been a Christian for over 60 years and her passion is to encourage other people in their Christian walk. She serves the church in visiting those who are sick and long-term homebound and those in need of support. Edna is a retired Psychiatric Nurse working for the NHS for 24 years.